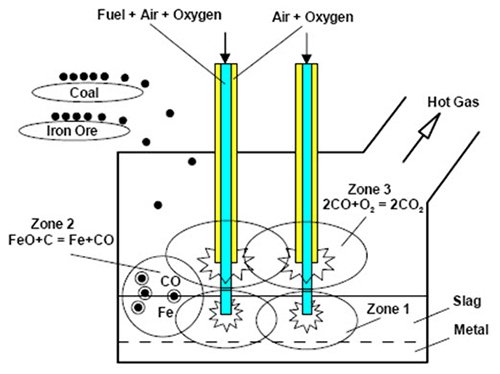 Figure 1 shows the three reaction zones in AusIron while Table 1 shows the location and descriptions of the resultant three zones. • Direct use of non-coking coals. • Simple use of ferrous materials, no pelletising or sintering is required. • High quality metal product suitable for both electric and oxygen steelmaking. • Can use ferrous residues from minerals processing or steelplant waste products, as low cost feed to produce pig iron. • An efficient, single stage process not reliant on preheating or pre-reduction of ore feeds. • Product gases are fully combusted within the furnace, and can be directly fed to energy recovery equipment, simplifying offgas handling. • The furnace operates at subatmospheric pressure allowing simple feeding and tapping arrangements. • Lances can be raised clear of the furnace simplifying maintenance. • Low environmental impact. The absence of coke ovens and sinter/pellet plants reduces environmental issues typically associated with ironmaking. • Power Generation. A waste heat boiler system, directly coupled, can generate sufficient electrical power to supply the ironmaking facility and associated oxygen plant, with surplus power available for sale. • Low capital. 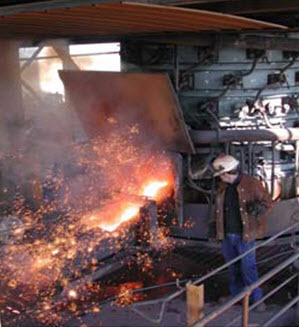 The use of a single stage, highly efficient smelter reduces capital requirements for new ironmaking capacity and permits effective use at smaller scales of operation than conventional processes. • Operating flexibility. The lance based operations offer the ability to start, stop and idle the process easily.